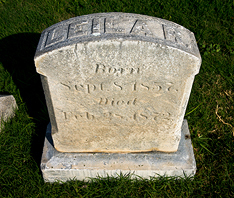 Leila Shugart was the first person to be buried in Evergreen Cemetery. The 14-year-old daughter of colonist Dr. Keltia Davis Shugart died on February 28, 1872. Although the Southern California Colony Association had set aside a parcel of land for a cemetery, the association to administer it had not yet been founded and the cemetery got underway later that year. Once it began operating. Dr. Shugart moved his daughter’s body from the family property to Evergreen.